Holistic Health and Pastoral Care. 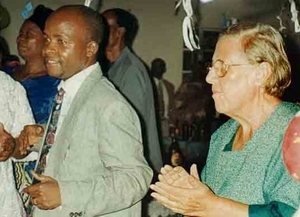 Pastor Lazare Tshibuabua and Dr. Cécile de Sweemer, celebrating Butoke’s inauguration in March 2005. A function of these cells is to help to deepen Butoke’s understanding of development problems and priorities in each area – a function consistent with Butoke’s name, which means “light,” in this case, the light of understanding. Butoke’s statutes permit it to act as an implementing agency, to provide support for other NGOs and civil society organizations or to engage in remunerated consultation work. Butoke’s Executive Director, Dr. Jean Lumbala Muamba, is an agronomist with 10 years experience both as teacher and director of an agricultural college and as field supervisor of agricultural extension projects. Dr. Lumbala obtained his medical degree in 2006 and coordinates Butoke’s activities in the health sector, in addition to being Butoke’s Executive Director. 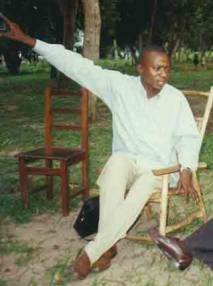 Butoke’s chief financial officer is Pastor Lazare Tshibuabua, Executive Presbyter of the Kananga Presbytery. Butoke benefits from high-level technical support from its Chair of the Board and senior consultant Dr. Cécile De Sweemer, who has 45 years of experience in developing countries. She has resided in Kasai since February 2004. Click here to access Cécile’s story as written by Butoke supported Dickens Warfield. For more information on Butoke, please refer to the full version of its statutes and rules of internal order (available only in French, at this time, except for the preamble) as well as to the list of Butoke members and signatories.